Describe key features of Lightning Experience. Salesforce is your customer success platform, designed to help you sell, service, market, analyze, and connect with your customers. Salesforce has everything you need to run your business from anywhere. Using standard products and features, you can manage relationships with prospects and customers, collaborate and engage with employees and partners, and store your data securely in the cloud. But standard products and features are only the beginning. Our platform allows you to customize and personalize the experience for your customers, partners, and employees and easily extend beyond out-of-the-box functionality. So where does CRM fit in with all of this? Let's start by defining what CRM is. CRM stands for Customer Relationship Management. This technology allows you to manage relationships with your customers and prospects and track data related to all of your interactions. It also helps teams collaborate, both internally and externally, gather insights from social media, track important metrics, and communicate via email, phone, social, and other channels. In Salesforce, all of this information is stored securely in the cloud. Let's take a closer look at how that works, using an example you might be familiar with—a spreadsheet. Salesforce organizes your data into objects and records. You can think of objects like a tab on a spreadsheet, and a record like a single row of data. You can access objects from the navigation bar. Select any record to drill into a specific account, contact, opportunity, or any other record in Salesforce. So what exactly are objects and records? Let’s take a minute to define those, along with a few other terms you are going to need to know as you continue on your Salesforce adventure. So, that’s objects, records, and more, and now you have some insight into how your data is organized in Salesforce using our spreadsheet example. But unlike an actual spreadsheet, your Salesforce data is stored in our trusted, secure cloud and has an easy-to-use interface, which you can access both from the desktop and your mobile device. 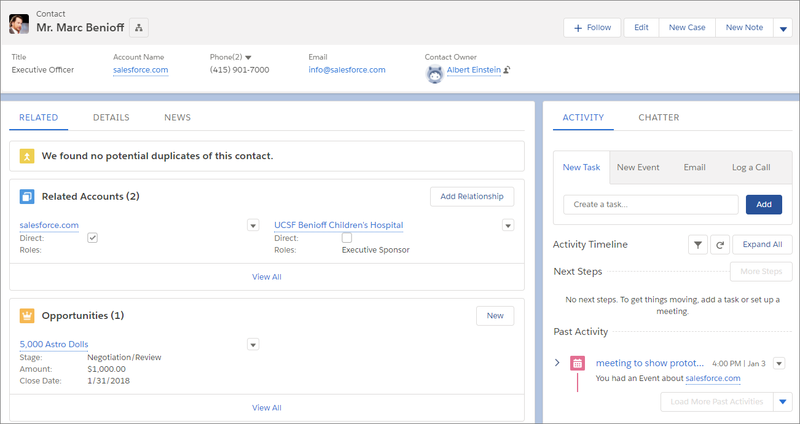 And using point-and-click tools, you can easily import your data into Salesforce. Salesforce comes with a set of standard objects already set up and ready for use. Here are some of the core standard objects, and a description of how each one is used. Accounts are the companies you’re doing business with. You can also do business with individual people (like solo contractors) using something called Person Accounts. Contacts are the people who work at an Account. Leads are potential prospects. You haven’t yet qualified that they are ready to buy or what product they need. You don’t have to use Leads, but they can be helpful if you have team selling, or if you have different sales processes for prospects and qualified buyers. Opportunities are qualified leads that you’ve converted. When you convert the Lead, you create an Account and Contact along with the Opportunity. Salesforce CRM allows you to manage and access your data in sophisticated ways that you could never do with a simple spreadsheet. Your records can be linked together to show how your data is related, so you can see the whole picture. Are you a visual learner? Take a look at how it fits together. And if you’d like to go deeper, be sure to check out the Data Modeling module here on Trailhead to learn more about how your data is organized. So that’s the basics of the standard object model, but that’s only the beginning, because Salesforce CRM is built on a platform. The term “platform” may initially seem intimidating. Try to think of it like this: a platform allows you to take everything that comes standard and customize it. Here’s an example. Let’s say your sales managers want to request work from you, the Salesforce Admin, on a regular basis. They might request reports, data imports, and more. Using the platform, you can build out a process to manage the intake of that work. You don’t have to stop there. You can set up automatic email notifications every time a new request comes in, or create dashboards and reports to view all of your open requests. This is the power of Salesforce CRM and the platform. 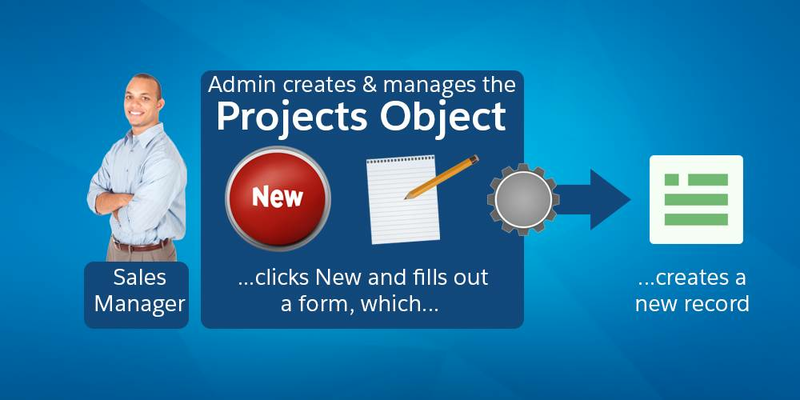 Now you understand the basics of Salesforce and the object model. But how do your sales reps actually work with Leads, Opportunities, Contacts, and Accounts? They need a productive interface to help them close more deals faster. And that’s where Lightning Experience comes in. Welcome to Lightning Experience! 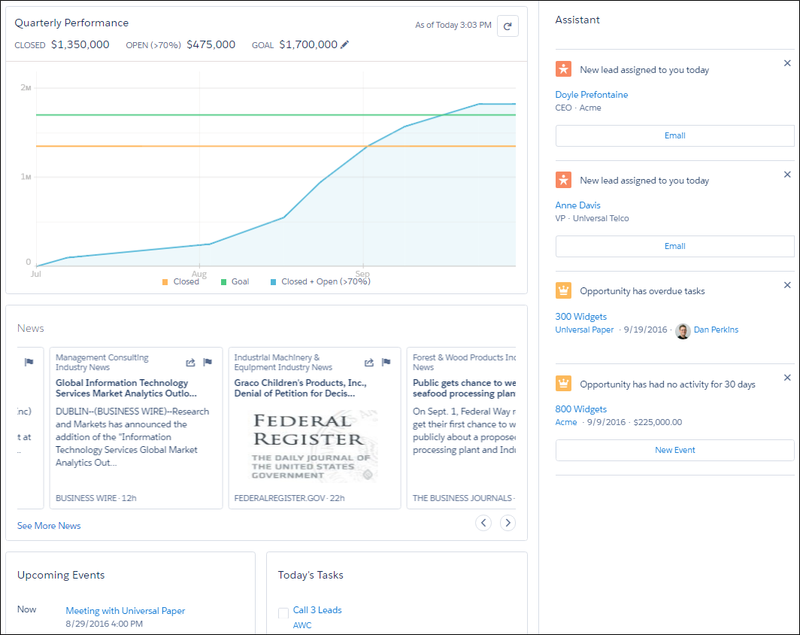 Lightning Experience is a modern, productive user experience designed to help your sales team close more deals and sell faster and smarter. The rise of mobile is influencing the way people work. Your sales reps are using mobile to research prospective customers, get directions to client meetings, connect socially with customers, and more. We get that. That’s why with Salesforce, you get cool stuff in both desktop (with Lightning Experience) and mobile (with the Salesforce app). What sales reps love about the desktop with Lightning Experience... …is also available on the go with the Salesforce app. 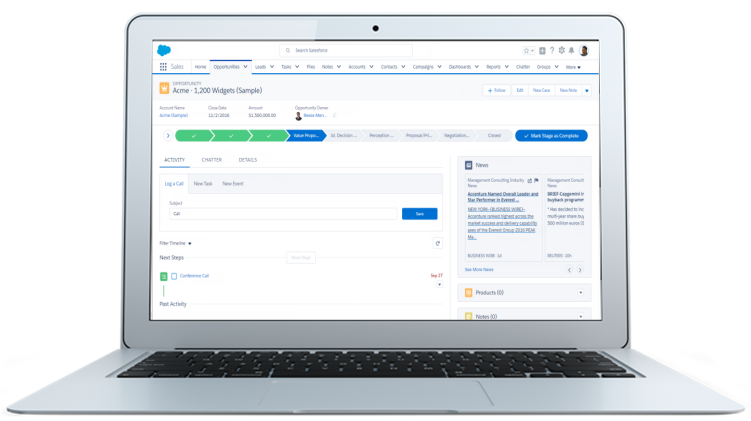 When we’re talking about Lightning Experience, we’re talking about pages in Salesforce optimized for sales use. We’re talking about new features that help your sales reps focus on the right deals and the right activities, every time they log into Salesforce. We’re talking flexible, interactive tools that the sales rep can use to visualize data on the fly and work deals in flight. But before we go any further, let’s talk about how Lightning Experience got its name, and why we built Lightning Experience in the first place. Let’s start with the name, and while we’re at it, the correct spelling of the name. So why the name “Lightning?” Well, think for a moment about actual lightning, the kind you see during a storm. Think about how fast it strikes—if you blink, you might miss it. Think about how beautiful it is—lightning can be stunning to behold. Finally, think about how unique each lightning bolt is—no two are the same. That’s a lot like Salesforce Lightning Experience. It’s fast, it’s beautiful, and it’s unique to each sales rep. It’s an easy-to-use experience, designed to help sales reps sell faster, with personalized alerts and an interactive assistant to help each sales rep focus on what’s important. Ultimately, we built Lightning Experience because of you, our customer. Lightning Experience is the result of everything we’ve learned from you over the past years and releases. 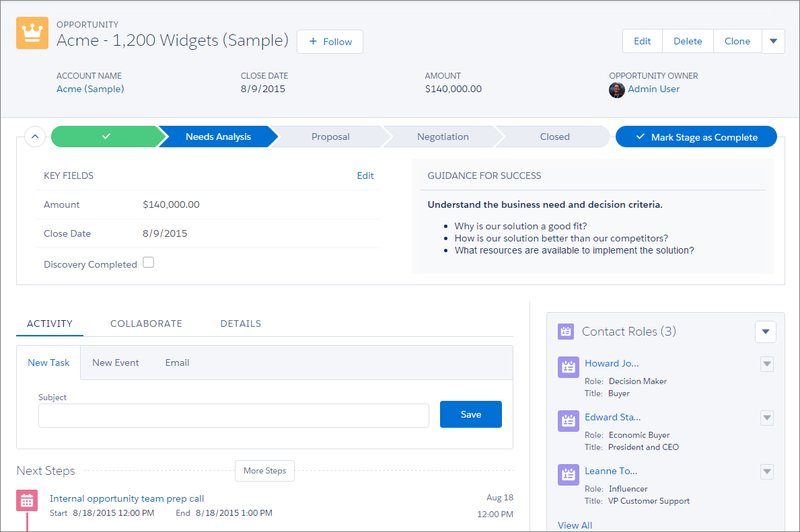 Lightning Experience is the killer sales app you can deliver to your sales rep. There are a number of key benefits with Lightning Experience. We won’t cover everything here, but for each area of the product, we’ll highlight some of the neatest things. Now let’s dive into some feature-specific benefits. Home is a modern, intelligent home page, featuring a number of tools to help your sales team start their day fast. From Home, sales reps can monitor their performance to goal and get insights on key accounts. They can also access the Assistant, a list of things to do and places to be. If you remember the definitions that we reviewed at the start of this unit, opportunities are leads that are qualified to buy. When your sales reps click on an opportunity, they’ll see a powerful workspace where they can get stuff done quickly and focus their energy on selling. Enter the opportunity workspace. Here, your sales process takes center stage, with customized coaching scripts for each stage in the sales process, at-a-glance insights and activity timeline, and the ability to create records quickly with fewer clicks. 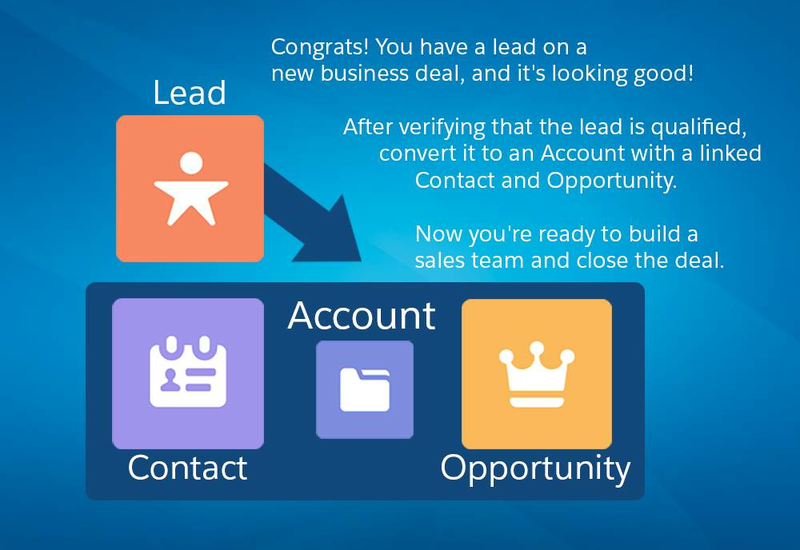 Remember that when an opportunity is converted, an account and contact are also created in Salesforce. An account is a company you’re doing business with, and a contact is someone who works at that account. Just like with opportunities, anytime your sales reps drill into an account or contact, they need to find what they’re looking for quickly. But unlike with opportunities, with accounts and contacts your reps are less likely to need to make updates. So we’ve optimized the layout for these pages for quick reference, allowing your sales reps to find information and gather insight at-a-glance. List views allow you to see records that are important to you. 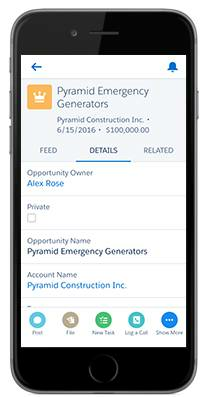 Using filters, you and your sales reps can create customized lists of accounts, contacts, opportunities, or other records in Salesforce. 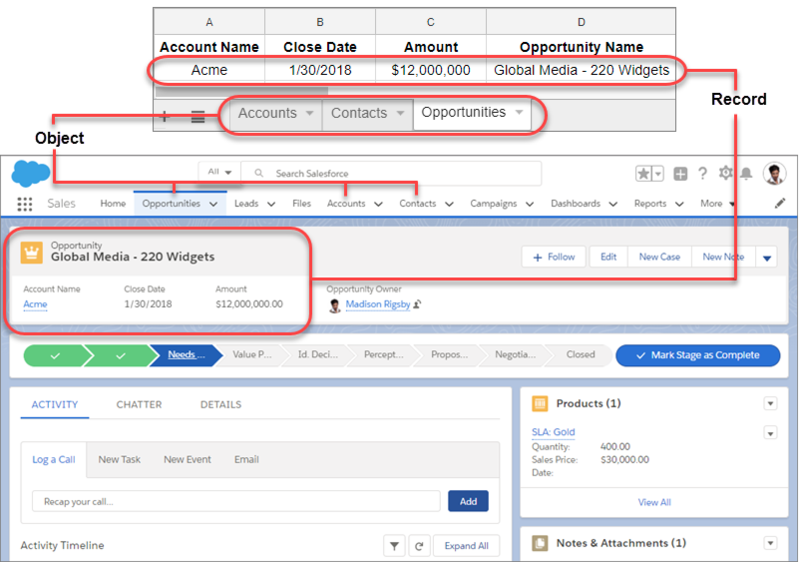 For example, a sales rep can create a list view of opportunities they own and add a filter on amount, to help them find their biggest deals in the pipeline. But with Lightning Experience, list views are more than just columns of text. Power up your sales rep productivity with list view charts, allowing them to visualize their data graphically with a handy chart, all created on the fly without an admin’s help. Sales reps can use the Opportunity Kanban, a visualization tool for opportunities, to review deals organized by each stage in the pipeline. With drag-and-drop functionality, sales reps can move deals from one stage to another, and get personalized alerts on key deals in flight. Similar to list views, reports are a list of records that meet the criteria you define. But unlike list views, with reports you can apply more complex filtering logic, summarize and group your data, perform calculations, and create more sophisticated visualizations of your data using dashboards. 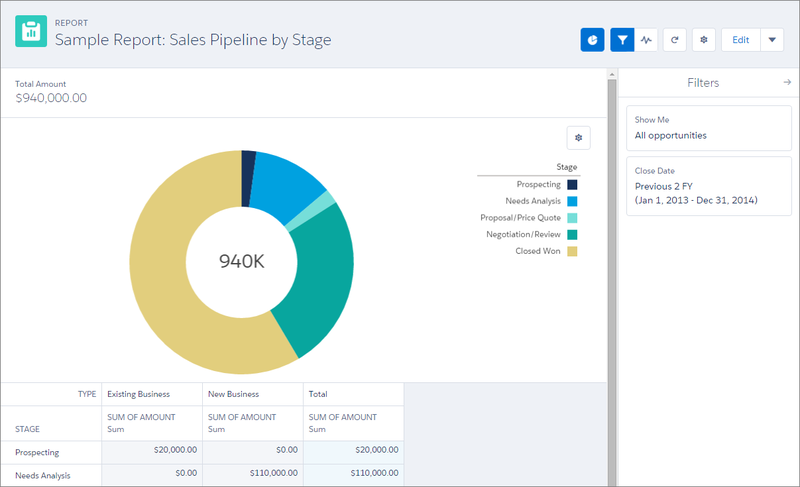 Using Lightning Experience, sales reps will love the ability to create their own filters on reports, and admins will appreciate the dashboard editor, with spanning columns and a flexible layout, allowing you to place more dashboard components (charts) in different sizes on a single dashboard.